Oak Ridge National Laboratory (ORNL) has developed a new laser method of joining carbon fiber composites and aluminum in the manufacture of lightweight cars and other multi-material high-end products. The process, developed by a team led by Adrian Sabau, would replace the practice of preparing the surface of the materials by hand using abrasive pads, grit blasting and solvents. Using a laser to remove layers of material from surfaces prior to bonding improves the performance of the joints and provides a path toward automation for high-volume use, the lab said. 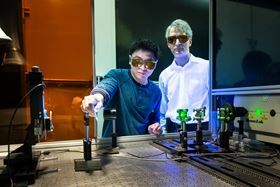 Adrian Sabau and Jian Chen work with a laser to prepare the surface of carbon fiber composites and aluminum. The surface treatment of aluminum and carbon fiber polymer composite is an important step in the adhesive joining process, which directly affects the quality of bonded joints. Aluminum surfaces often contain oils and other contaminants from production rolling operations while carbon fiber surfaces can contain mold releases. ‘These surface contaminants affect surface energies and the quality of adhesion, so it is critical that they are removed,’ said Sabau, adding that the laser also penetrates into the top resin layer, leaving individual carbon fibers exposed for direct bonding to the adhesive and increasing the surface area for better adhesion. In tests, the strength, maximum load and displacement at maximum load of single-lap shear joint specimens were increased by 15%, 16% and 100%, respectively, over those measured for the baseline joints. Also, joints made with laser-structured surfaces can absorb approximately 200% more energy than the conventionally prepared baseline joints, the researchers claimed.